It’s impossible to look at Avengers: Infinity War as its own individual thing. In the decade since Iron Man was released back in the summer of 2008, 18 interconnected films have made up what has fondly become known as the Marvel Cinematic Universe or MCU. While some of these comic book-based adventures have stood on their own better than others have, recent hits Guardians of the Galaxy Vol. 2, Thor: Ragnarok and this past February’s Black Panther particularly so, all of them still have fed upon every title that preceded it, each one slowly building to this epic showdown between almost all of these heroes and the purple-skinned titan Thanos (Josh Brolin). Iron Man, Captain America, Thor, Black Widow, Hulk, Spider-Man, Doctor Strange, The Scarlet Witch, Vision; they’re only a handful of the cadre of warriors tagged as “Earth’s Mightiest Heroes” found fighting for the survival of the entire Universe here, each pushed to their proverbial limit as they place all they have and more on the line in order to defeat their all-powerful adversary. It was in The Avengers where we learned of Thanos. 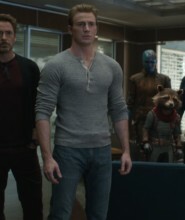 He was the one who sent Loki (Tom Hiddleston) to Earth with a horde of alien warriors to subjugate humanity only to be turned away by Tony Stark (Robert Downey Jr.), Steve Rogers (Chris Evans), Thor (Chris Hemsworth), Bruce Banner (Mark Ruffalo) and a handful of others in an epic battle that revealed humans were not alone in the Universe. It was in Guardians of the Galaxy that rapscallion Peter Quill (Chris Pratt) joined forces with Drax (Dave Bautista), Rocket (voiced by Bradley Cooper), Groot (voiced by Vin Diesel) and the assassin Gamora (Zoe Saldana), a child of Thanos, to stop another of the genocidal madman’s warriors from destroying a different planet in one of the furthest reaches of the galaxy. It was in Captain America: Civil War where the Avengers were fractured, making them vulnerable to an attack. It was in Thor: Ragnarok where Thanos finally revealed himself, pulling up next to a fleeing Asgardian ship in his own massive battle cruiser after Thor, the Hulk, Loki and a small team of warriors helped save Asgard’s populace from total annihilation. None of these events happened in a vacuum. Neither did ones that transpired in any of the Iron Man adventures, Doctor Strange, Ant-Man, Spider-Man: Homecoming or even the otherwise forgotten The Incredible Hulk. As far as the MCU was concerned, everything was connected, each link in the chain leading to Thanos and his minions arriving on Earth to finish collecting a series of artifacts forged in the fires of creation known as the Infinity Stones. 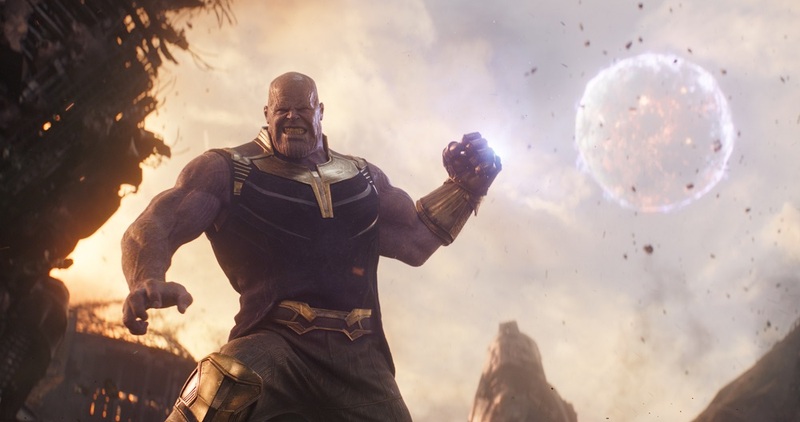 With all six of them, the titan could destroy half of all life in the Universe with a snap of his fingers, an event he views as an act of kindness. In one instant he can end overpopulation and overconsumption, showing no preference between rich or poor, young or old, allowing the whims of fate to make the decision for him. It is this calamity these heroes, introduced one after another over the past decade, are going to join forces to stop. It is against this menace they must all pool their powers together into one all-consuming force if they are going to have even the slightest chance to emerge victorious. Make no mistake, this is a massive undertaking, and one must respect the audacity of the folks at Marvel and at Walt Disney Studios for taking so much time and for paying so much attention to detail in order to pull it off. Handing the keys to the kingdom to writers Christopher Markus and Stephen McFeely and directors Anthony Russo and Joe Russo, the core foursome responsible for Captain America: The Winter Soldier and Captain America: Civil War, the quartet has done a decent job of bringing all of these worlds and characters into one cohesive story, one that somehow avoids being nothing more than a series of strangers introducing themselves to one another over and over again. They are able to do this because, instead of focusing on the heroes, they concentrate on the villain, Thanos the central figure around which all of this carnage, bloodshed and planet-level destruction revolves around. At the same time, nothing that happens inside Infinity War works well on its own. 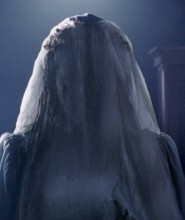 The movie often feels like a bloated special event episode of a popular television series, one that required you to have watched, not just the prior season, but to be intimately familiar with storylines and events that had happened throughout the show’s entire run. While there is a modicum of joy to be had in discovering how Markus and McFeely are going to tie off loose ends from previous MCU entries, it also means if one hadn’t seen Guardians of the Galaxy or paid close attention to Captain America: The First Avenger they might not get the reference currently being made. It also means that, with rare exceptions, the screenwriters don’t spend a ton of time giving any of the heroes new emotional dimensions to explore. Instead, they’re all too busy trying to figure out how to save the Universe, meaning any sort of complexity that that would make an individual’s selfless sacrifice or tragic demise more affecting is significantly muted in a way that’s frustratingly inadequate. Worse, this third go-around with the Avengers has the same core problem that plagued Captain America: Civil War. 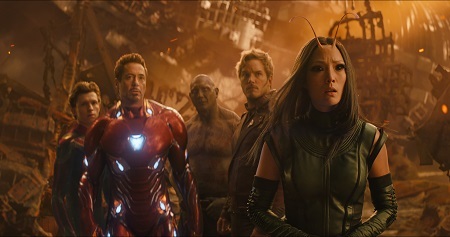 For all its grandeur, for all its technical merit, for all its cutthroat willingness to let the bodies hit the floor, at a certain point it becomes clear the only reason Infinity War exists is to play like a 149-minute coming attraction reel for July’s Ant-Man and the Wasp, February’s Captain Marvel and, ultimately, the still untitled fourth Avengers epic set to wrap things up next summer. More importantly, by upping the ante so significantly the filmmakers end up inadvertently becoming their own worst enemy, and as staggering as the losses for the heroes might initially appear, as we already know so much of what is coming next it’s fairly obvious barely a fraction of the butchery Thanos exacts against these superheroes is going to be allowed to stand pat as far as future stories are concerned. Even so, as blatant and as annoying at the climactic cliffhanger might be, this is still an impressive motion picture, mainly because, as already mentioned, for the first time ever the central figure propelling the narrative forward turns out to be the villain and the villain alone. If Black Panther started the MCU down that road, Markus and McFeely take that idea and run with it in a way that is intricate, intimate and surprisingly effective. Brolin’s performance is both terrifying and humane, pitiable and unforgiving, and while his genocidal machinations are unpardonable they’re still rooted in an understandable truth that’s breathlessly haunting. The way the film emphasizes the relationship between Thanos and Gamora is masterful, the story’s best, most otherworldly moment of incomprehensible grief happening between them, Brolin and Saldana sharing a chemistry that broke my heart into a myriad of pieces I wasn’t altogether certain I’d be able to reassemble afterward. And yet, I cannot embrace Avengers: Infinity War with open arms. Characters not present for this installment are dismissed with barely a line of dialogue explaining their absence, and considering the stakes involved this is definitely an instance where that sort of pithy nonchalant non sequitur does not pass muster. 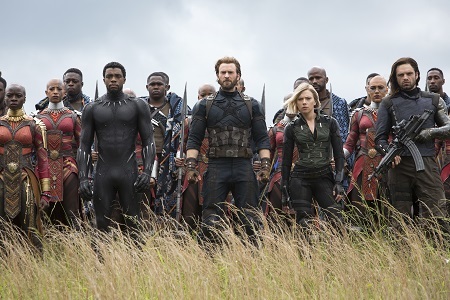 Equally unsurprising, with so many characters fighting for screen time, a number of these heroes are not given much more to do than grunt, shout, sweat and fight almost as if they’re just another one of the faceless Wakandan warriors standing side-by-side with the Avengers during the story’s climactic act. 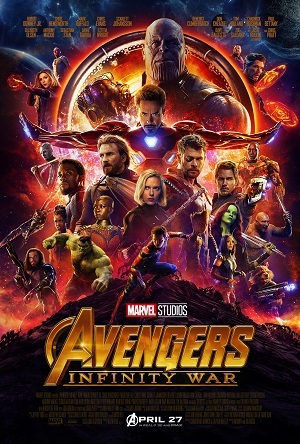 I also cannot get past the simple truth that, in the end, as bad as it all appears, as amazing as the heroics might be and as astonishing as the fighting is, nothing happens, all of the answers to the various questions aggressively put forth by the filmmakers to be answered in future MCU endeavors yet to be released. What does any of that mean? Honestly, I’m not sure. 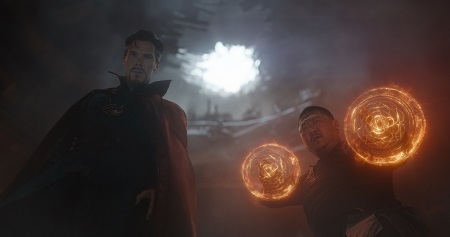 For my part, as terrific as both Brolin and Saldana are, as magnificent as a few individual moments prove to be and as shocking as the last act undeniably is, because so much is purposefully unresolved and so little is actually decided, I just can’t say I enjoyed watching Infinity War all that much. I respected the film more than I anticipated, admired its brutal, almost Shakespearean or Greek Myth level of pathos and tragedy. But as a singular tale that I could take pleasure in watching on its own outside of any other piece of the MCU puzzle, I just can’t go there, all of which makes Thanos and his moon-tossing abilities far less impactful than they by all accounts should have been.